exercises require HCPCS Level II codes. Condition and procedure statements in the exercises reflect the current annual editions of the coding manuals. By completing the exercises in this workbook, you will expand your medical vocabulary, improve your coding skills for the physician's office, and learn to code only what the documentation supports. 2011 CODING WORKBOOK FOR THE PHYSICIAN'S OFFICE also covers The Center for Medicare and Medicaid Services (CMS) guidelines for diagnosis coding and reporting by physicians and this new edition includes an additional chapter called, "Moving from ICD-9-CM to ICD-10" to help prepare you for the upcoming shift to ICD-10-CM. Additional practice with ICD-10-CM is included within the ICD-9-CM section. 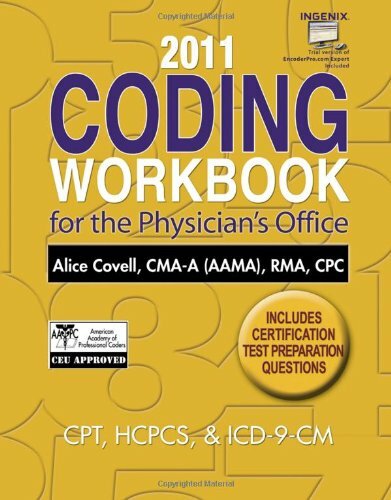 You need current CPT, ICD-9-CM, and HCPCS coding manuals to complete the exercises in this workbook.